What to expect from the Miami Dolphins in any given week is a mystery, but Sunday's 20-16 victory over the San Diego Chargers could be a victory that the Dolphins look back on as a turning point moving forward in 2013. Not only did the Dolphins overcome locker room adversity and a loss to the NFL's last winless team, to top San Diego on Sunday, but Miami with the victory, moved into a tie for the final wild card spot in the AFC. Thanks to a 37-14 victory from the Buffalo Bills over the New York Jets, Miami and division rival New York are all square for the final wild card spot in the AFC at 5-5. Miami, who entered Sunday with a 4-5 record, also got help from around the league as the four other 4-5 AFC teams entering Week 11 all lost. 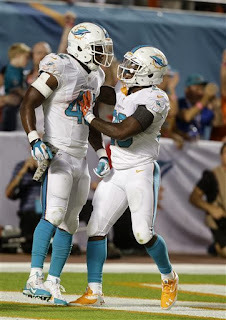 Miami helped itself by beating a San Diego team that like the Dolphins, entered Sunday 4-5. Losses this week however, by Tennessee, Cleveland and Baltimore have helped eliminate some of the clutter in the race for the final AFC playoff spot as well. While the Jets hold the current tiebreaker over the Dolphins, Miami will have every opportunity to change that as the teams face off twice in the final six weeks. Regardless of what happens in Sunday's upcoming contest with the Carolina Panthers, the Dolphins can be at the very least tied for the final wild card spot heading into the final quarter of the season simply by winning in East Rutherford on December 1st, a place where Miami dominated the Jets a season ago. Sunday's victory was one to certainly be encouraged about as the Dolphins were coming off of a devastating loss to the Tampa Bay Buccaneers and a franchise-low 2 yards rushing. Without starting center Mike Pouncey, the Dolphins finished with 104 yards rushing on 19 carries, a 5.5 yards-per-carry average. Tight end Charles Clay had a big day leading all receivers with six catches for 90 yards and the only touchdown of the second half which put the Dolphins ahead for good. The win over San Diego on Sunday also marked the first time this season in which the Dolphins did not trail in the second half. With six weeks to go, the Miami Dolphins have life. Despite dropping five of their last seven games after a 3-0 start and having to deal with the first locker room bullying scandal in NFL history, the Dolphins have managed to rally around one another and appear to have as good a chance as any of the teams on the outside looking in in the AFC, to be playing football in January. Though Miami has played either up or down to its competition all season long, only two of Miami's final six opponents currently have winning records and both will have to come to Sun Life Stadium. Two games with the Jets will prove crucial as will a December 8th visit to Pittsburgh, a team that suddenly sits just a game back of the final playoff spot. It's hard to envision the final team making the playoffs in the AFC with a record of better than 9-7. For Miami, that would mean a 4-2 finish in its last six games. While we don't know at this point what will happen over the final six weeks of the NFL, what we have learned is that this Dolphins team doesn't look to be one that's willing to roll over and die. For that, head coach Joe Philbin deserves a lot of credit.